High school prom season starts this Saturday, April 13, when Glens Falls, Queensbury, Argyle and Greenwich all break out the gowns, tuxedos, limos and corsages. Here’s a prom overview. Time & place:Saturday, April 13, 7-11 p.m. at The Great Escape Lodge. Theme: Under the Midnight Sun. Tickets: $75. Grand March: 5:30 p.m. in the high school gymnasium. Admission is $1. PTSA After-Prom Party: midnight to 4 a.m. at Glens Falls High School. Surprise theme! Time & place: Saturday, April 13, 8 to 11 p.m., at The Hiland in Queensbury. Grand March: 6-7:30 p.m. at Queensbury High School. Tix: $1. Post-Prom Party: Midnight to 4 a.m. at the high school. Food, games, prizes and a special show, all free. Theme: Superheros. Time & place: Saturday, April 13, 5:30 p.m. at Excelsior Springs Courtyard Marriott Saratoga Springs. Theme: Winter Wonderland. Tickets: $55. Grand March and Coronation: 3:30 p.m. at Argyle Central School. Theme is the same. Admission: $2, $1 child. After Prom Party: 11 p.m.-3 a.m. at Adventure Family Fun Park, Queensbury. Time & place: Saturday, April 13, 6 -10:30 p.m. at the Waterford Banquet House, Saratoga Springs. Promenade and Coronation: in the High School auditorium, 4:45 p.m.
After Prom Party: 11 p.m.-2:30 a.m. at The Fun Spot in Queensbury for Go-Karts, Laser Tag and more. Time & place: Saturday, May 4, 7-11 p.m. at Courtyard by Marriott, Lake George. Theme: A Night to Remember. Grand March & Coronation: 5 p.m. in the school gym. Theme: Adirondack Elegance. Post Prom After Party: Midnight to 5 a.m. at Adventure Racing in Queensbury. Notable: Post Prom Party is traditionally attended by nearly if not all Juniors going to PROM! Most years 100 percent go, the school said. Time & place: Saturday, May 4, 7 to 11 p.m. at Six Flags Great Escape Lodge in Queensbury. Grand March & Coronation: 5:30 p.m. at the school. After-Prom Party: at Lake George Lanes and Games, sponsored by the parents’ committee. Time & place: Saturday, May 4, 4:30 p.m. at Hiland Country Club in Glens Falls. Coronation: Prior to prom, at the school. After Prom Party: 11:30 p.m. to 2 a.m. at Sky Zone in Queensbury. Time & place: Saturday, May 11, 6 to 11 p.m. at the Copperfield Inn in North Creek. Coronation and Grand March: 4 p.m. in the school gymnasium. After Prom Party: Game night, 11 p.m.-1 a.m. in the school cafetorium. Time & place: Saturday, May 11, 6 p.m. at Echo Lake Lodge in Warrensburg. Theme: Garden of Lights. Tickets: $57. Time & place: Saturday, May 11, 6:30 to 11:30 p.m. in the Adirondack Room at The Queensbury Hotel in Glens Falls. Coronation: 5 p.m. in the gymnasium Tix: $5. After Prom Party: Food, games, bounce house, Zorbie balls, prizes, 11 p.m.-3 a.m. in the school gymnasium. Theme: Empire State of Mind, with appropriate food vendors. Time & place: Saturday May 18, 6-11 p.m. Saratoga Holiday Inn, Saratoga Springs. Theme: A Night in Paris. Tickets: $70. Coronation and Grand March: 4 p.m. in the high school gymnasium, with the same theme. Tix: $2. 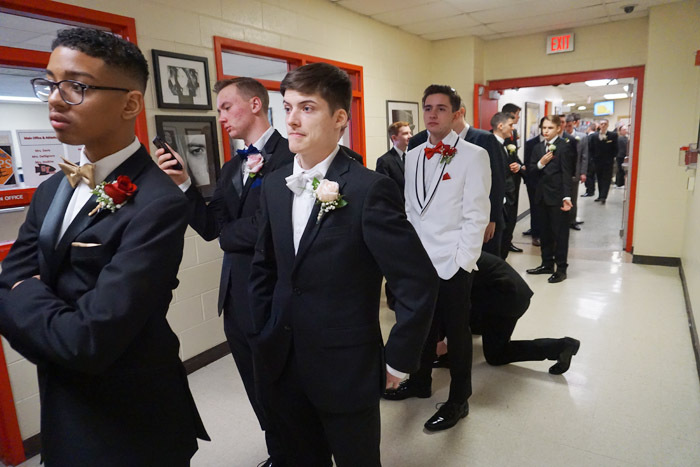 Notable: “Our school’s prom is a special night for all Junior students to come together to celebrate the close-knit community of Hudson Falls with their peers. We hope students will make some unforgettable memories to look back on in years to come,” the school said. Time & place: Saturday, May 18, 5-11 p.m. at Blue Water Manor, Bolton Landing. Grand March: 5 p.m. at Blue Water Manor. PTO Post Prom Party: 11 p.m. to 3 a.m. at Bolton Central School. Notable: All Bolton students in grades 9-12 may attend the Prom. Time & place: Saturday, May 18, 6:30 to 10:30 p.m. at Holiday Inn Resort, Lake George. Theme: A Night in Hollywood. Grand March: In the David L. Fisher auditorium at Fort Ann Central School, starting at 4 p.m. Theme is A Night in Hollywood. After-Prom Lock In: 11:30 p.m. to 3 a.m. at Adventure Family Fun Center, Queensbury. Time & place: Saturday, May 18, 6-11 p.m. at The Great Escape Lodge, Queensbury. Coronation: at 4-5 p.m. in the High School Auditorium. After Prom Party: 11 p.m. to 2 a.m. at the Great Escape Lodge Water Park in Queensbury.